I’ve sat in this chair a few dozen times before. I’ve held my breathe, clenched my teeth and burdened this deafening silence one too many times. This hallway never got any warmer, the sterile smell permeates the area still and although some of the staff have changed, their faces are all the same – filled with heartbreak and pity. 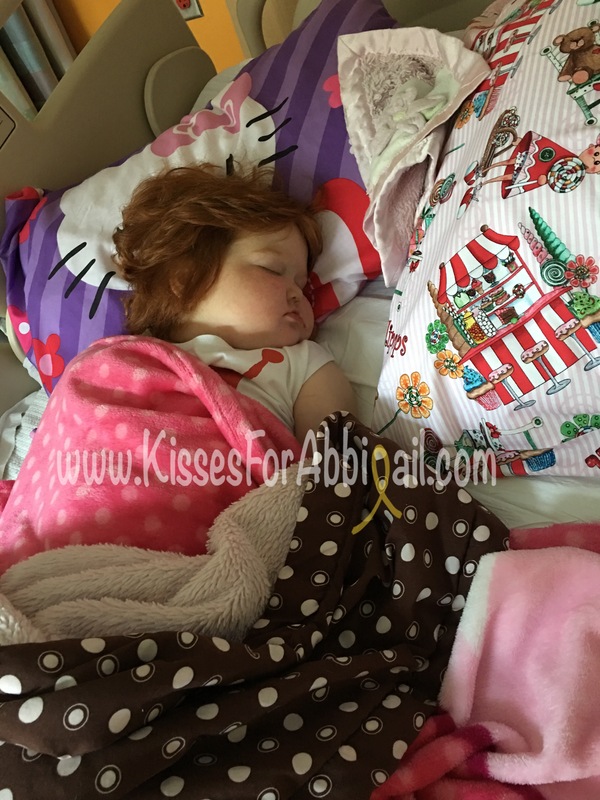 Abbigail is asleep under anesthetic, intubated and unaware of the piercing and poking radiologists are unleashing on her liver once again. She will wake up shortly, in need of oxygen, blood products and pain medication. She should be in school. She ought to be at recess right now, running with other little girls and boys. She is not. She will soon return to her very well known room on the oncology unit where she and I will wait for biopsy results and hopefully a plan forward. Two days, seven days, maybe a week or two or three…we don’t know exactly how long it will take to unravel this mystery and we don’t know if the damage done can be reversed. 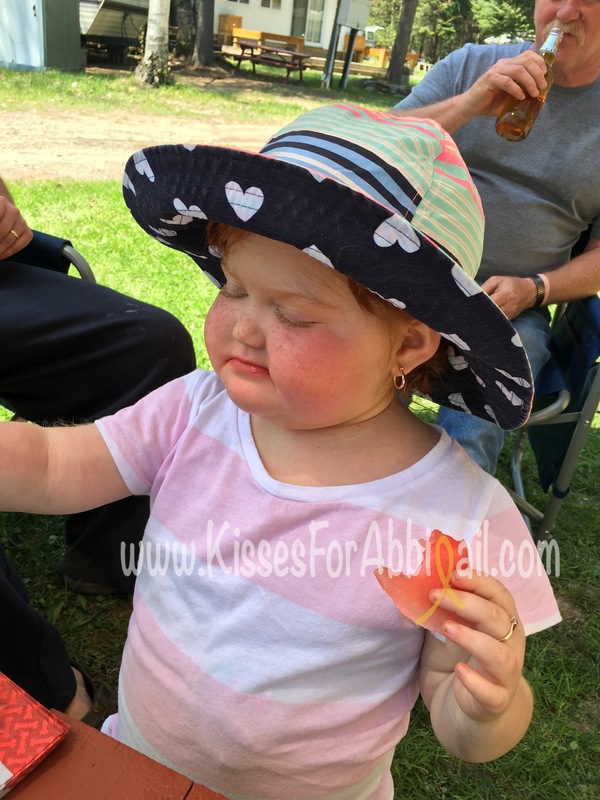 Abbigail began showing signs of possible liver damage or at the very least, signs her liver was not functioning at 100%, a few weeks ago, just before her sixth birthday. Added visits and bloodwork was ordered and we monitored her that way hoping her liver was simply adjusting to her new OMS protocol aimed at tapering her steroids without relapse. Mama noticed her eyes slowly turning more and more yellow as the weeks progressed and although there were some days of “normalcy” in her lab results, there was no fooling Mama. 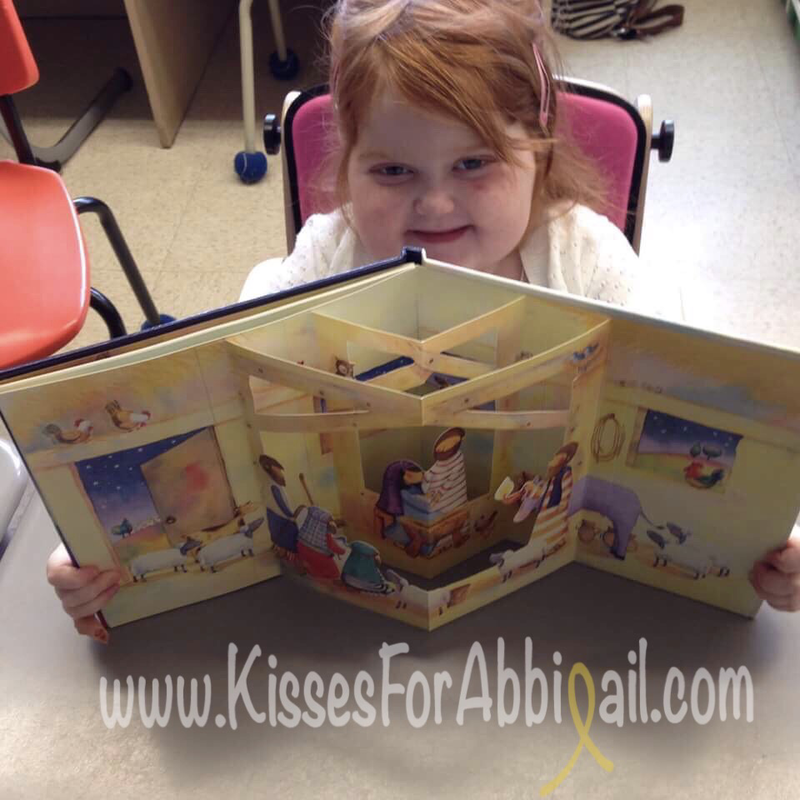 A couple more weeks went by and Abbigail was going to school less and less, tiring easily and sometimes falling into moments of mental dullness where responsiveness was obviously compromised. Ataxic and obviously unwell, there was no denying something wasn’t right. During routine bloodwork before treatment on Friday, we saw that her liver enzymes and functions were at alarming levels and needed investigating. Her chemos were immediately stopped, bringing us back to square one again with her OMS treatments, and she was immediately sent for an exploratory ultrasound of her pelvic area (liver and kidneys). 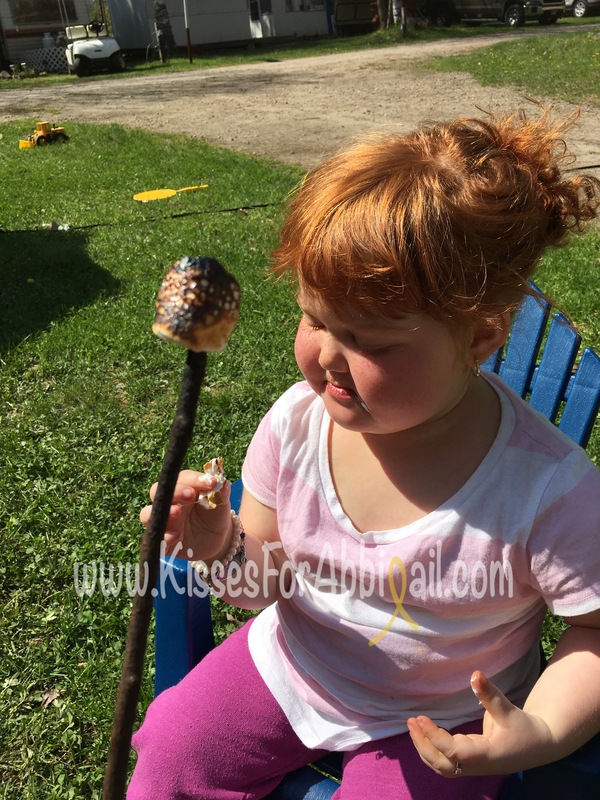 GI specialists were consulted and it was decided she would need further diagnostic and exploratory tests to determine why her liver is suddenly failing. Being admitted in hospital can have its advantages…who am I kidding, it’s unpleasant any which way you spin it, but thankfully we are blessed with wonderful nurses who genuinely care for Abbigail, doctors who are well versed in the mysteries of Abbigail and how can I forget Molly and Brenda; clown and childlife – I won’t say which is which! Being admitted Friday was not a pleasant thought knowing that the boys and camp were awaiting us with a sunny forecast for days and days so we luckily had our best advocate, Dr J by our side to convince GI that urgent admission Friday was not necessary, that Mama could and would recognize the need to return to the ER if things should worsen and that was how we rolled! Three beautiful days of memories made at our trailer with family and so many wonderful new friends. Abbigail hung in there and made it the weekend despite her obviously not feeling up to par. She’s always been a trooper, pushing herself beyond the limits which some would impose on her. 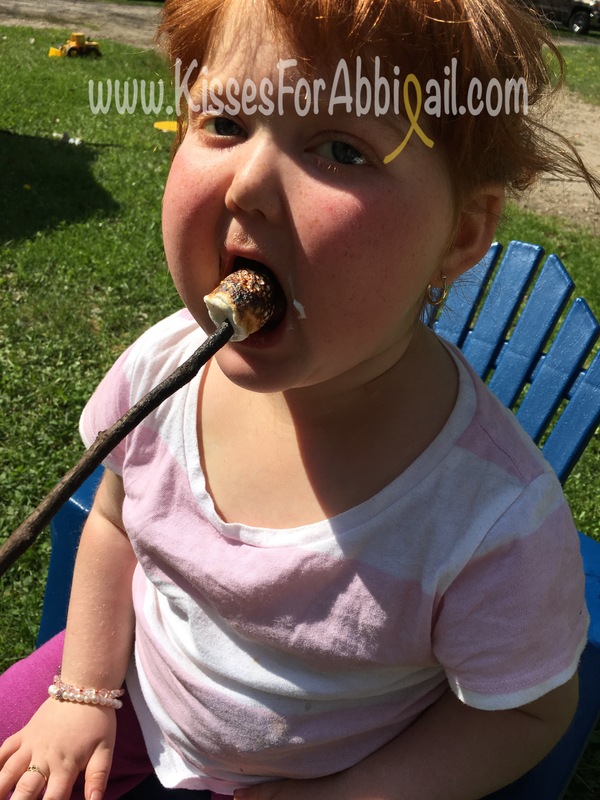 In between frequent picnic table naps and impromptu trailer crashing naps, she bummed food from each camper, hoarded it all and tucked it away for that rainy day she must know about, she walked more miles around the park than Mama could have and she consumed just the right amount of roasted marshmallows for the year’s first weekend at camp! Upon our return home Monday evening, the color change was prominent, the eyes were glossy and absent and she was not herself by any standards. One last nights sleep at home before checking back in Chez CHEO I told myself. Sleeping wedged between daddy and I, she obviously struggled through the night and the. 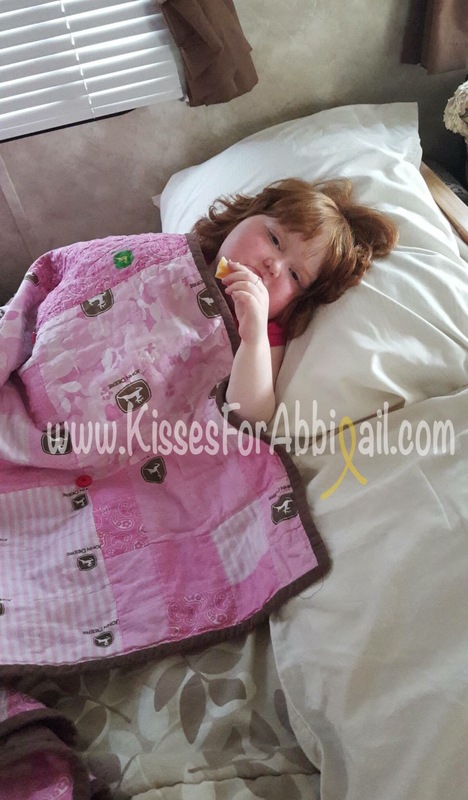 wasn’t easy to wake in the morning; which for Abbigail is a change since she is our family alarm clock, screeching at 530am every other morning. Kissed the boys goodbye, wished hubby an early happy birthday and hit the road for the long drive back here. She slept again the hour and half drive. Obviously not well, we arrived prepared for a stay but not for a long day of sit and wait. 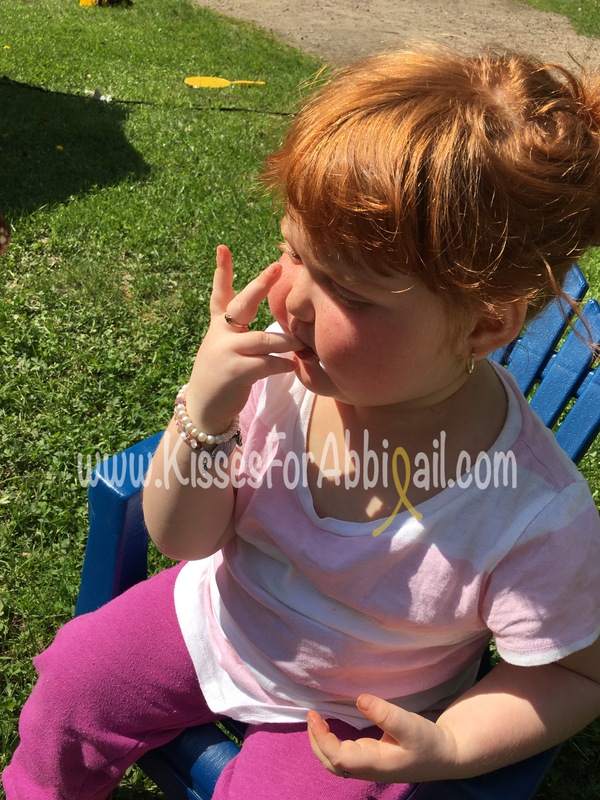 Abbigail struggled through the day and I couldn’t stop repeating the numbers from her lab results in my head – where did these come from? She was fine a month ago! Hours passed and finally by evening we were resting comfortably in her bed waiting for confirmation of what was to happen next. 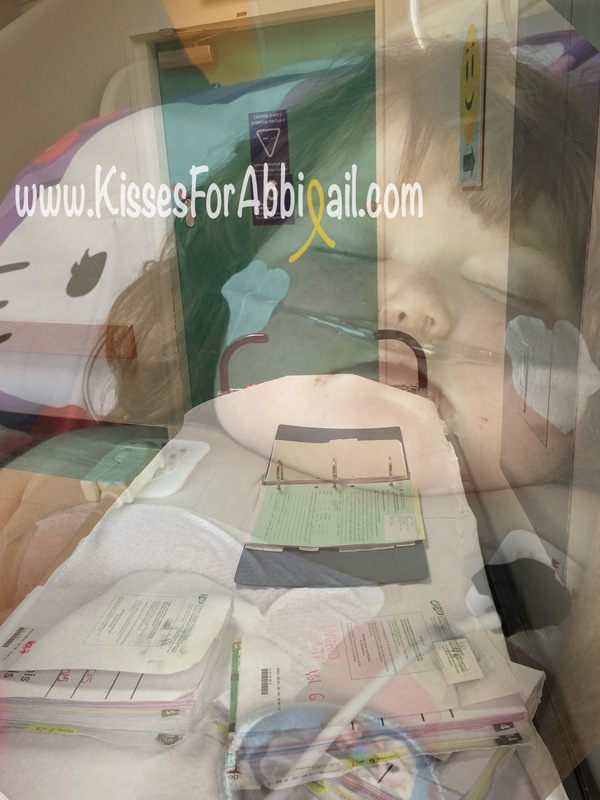 Abbigail by now is jaundiced, her liver no longer conducting its duties, and where it is providing some functionality, it’s minimal at best. So I wait in the halls, filled with fearful parents, most here for the first time, some for breaks, fractures, coughs or injuries unknown but likely none facing the odds this girl has faced and continues to face yet that didn’t change their fear filled eyes or worried souls. No matter the pain they are in, the source of injury they face, we feel it 100 times over as their parent. I hurt for my sweet girl.